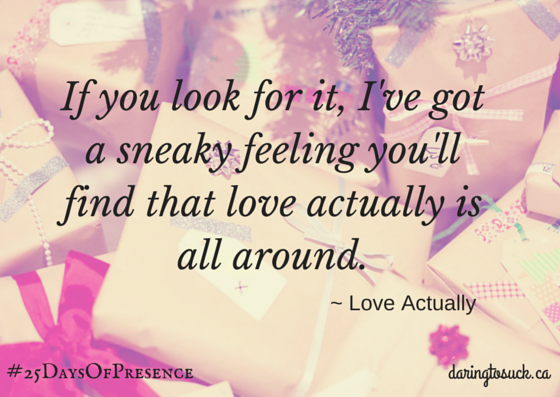 My hope for #25DaysOfPresence was to attempt being more present and share the gifts of presence as I went. I saw what I needed to see and felt what needed to be feel. I’ve done and undone. I’ve course-corrected when I slowed down during the busiest time of the year in a completely different way. And I thank you for coming along for the ride. Today, I received a gift this morning via an email from a friend who shared a story of seeing the portrait child prodigy Akaine painted of Jesus (featured in the book and movie Heaven is For Real). I saw the movie and remembered it clearly. It reminded me of the original and true story of Christmas about people coming together to celebrate and give whatever they had – out of the spirit of giving. And their gifts were fully received and rejoiced. They were truly grateful. In thinking about the simplicity of this, something opened up in me and a rush of emotion had me sobbing amongst my wrapping paper and ribbons. Not tears of sadness or melancholy. Of love. 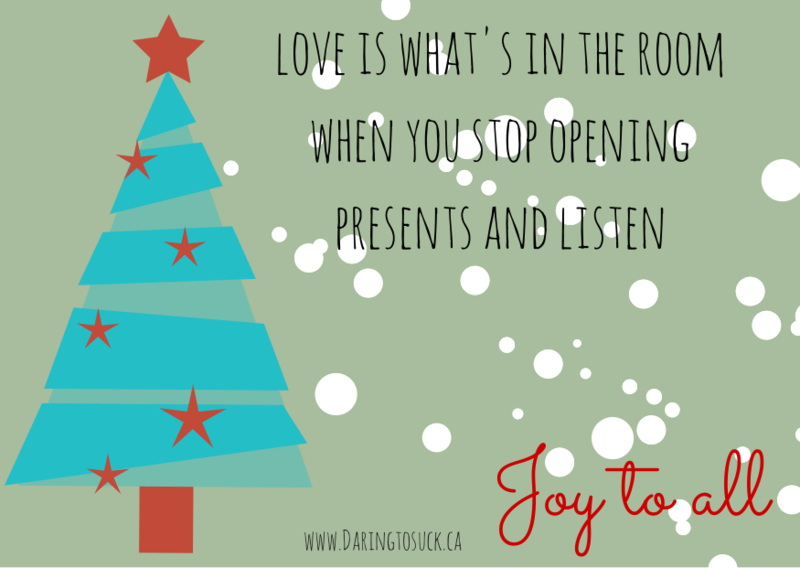 The love that happens when we slow down and receive the gifts all around us – not just in the packages we open. This year I’ve received many gifts and now see how they can take many forms, so pay attention. The more present and aware you are, the more you find. First, there are the obvious gifts you open and appreciate. There are also gifts in written and spoken words that touch your heart or wake you up, get your attention and point you in a new direction that feels right. There are gifts of experiences and gestures that tell you someone sees you and that you matter. Gifts can even show up in fights, disagreements and ‘life-is-happening-to-me’ moments that can be opportunities to clear the air and begin again, stronger and clearer. Do you even see me over here? Do you know what it’s like for me? Do you even care? Beuller? We never think to give the gift of being seen and acknowledgement to ourselves, FROM ourselves. This is one of the greatest ways we can receive. I never realized that I was the very person I needed to be seen and loved by. Turns out this is the best gift I’ve ever received is my own loving attention. To celebrate, document and acknowledge the things I’ve achieved, moments I’ve learned and ways I’ve changed for the better. As the year comes to a close, I’m asking you to take a moment and find as many things as you can to celebrate, acknowledge and give yourself credit for. Whether you do this silently or write it down in literal love letter to yourself. Simply let yourself know, Hey, you did that thing. I saw it all. And you are amazing. In line with this, in the book A New Earth, Eckhart Tolle suggests that whatever we are missing or wanting in our life – give it to others. Give without without expectation, attachment or obligation. That this has the power to change not only our experience of life, but the ripple effect on others is limitless and by law will find its way around back to us. And most importantly, on Receiving. Let go of have to’s. Let go of making it even. What if we stopped resisting and withholding from ourselves, the experience of receiving joy? When you receive an unexpected or unreciprocated gift, what would it be like to let go of all the above and just let the gift, in. To feel that you are seen, loved and considered. To let the gift in with a deep breath and two words “Thank you.” (minus the explaining, modesty or apologizing to try and make it even). What if you let in these moments of truth? That you are loved. That you are worth it. That you are seen and that you matter. This message is SO big so that many of us push it away. It’s too much to take in for fear we might turn arrogant, boastful or vain. Or that we may actually burst from the love bomb that’s hit us. We shake our heads… how can this be true? Receiving fully means you understand and accept your greatness. It suggests you are worthy of so much more than you give yourself. It also opens up the question – If others see this in me and love me so much, why am I so hard on me? I’m daring us all to fully stand in the bigness of receiving and to let all the gifts that present themselves in to land and take root. To reconcile with our self and make an agreement to never withhold or resist a compliment, a gesture, a kindness or a gift. Because what it suggests is true. We are worth it. So give it a try. Receive the compliments, the acknowledgements, the loving gestures and even awkward courageous arguments that serve to shift things into place for you. I dare us to experience it all this holiday season and all year round. Because, by receiving fully, the gift you give back is felt also. This is where receiving becomes the gift that keeps on giving. With much love for you all and readiness on my end to fully receive.